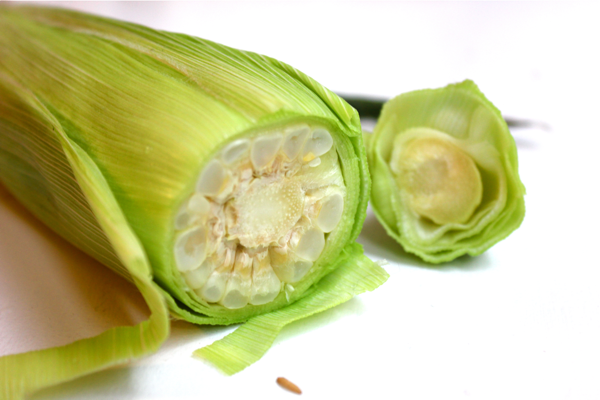 I realize that titling this post, Hairless Corn, might be a little disturbing, but if you’ve ever eaten a piece of corn on the cob and gotten its silky strands stuck in your teeth, then you’ll forgive me. 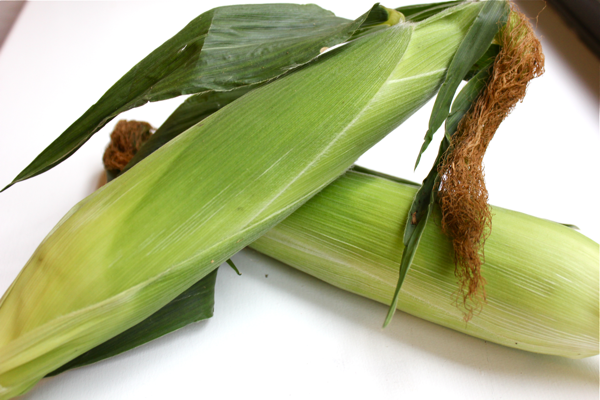 This corn-cooking method does a great job of getting all of the hairs off of your corn. The method has spread like wildfire through my family, so I thought I’d share it with you too. My grandmother recently got an iPad, and one of her friends sent her this corn-cooking video. She sent it to my mom, and around it goes. I don’t know if non-grandparent generations have discovered this video or not, but they should. 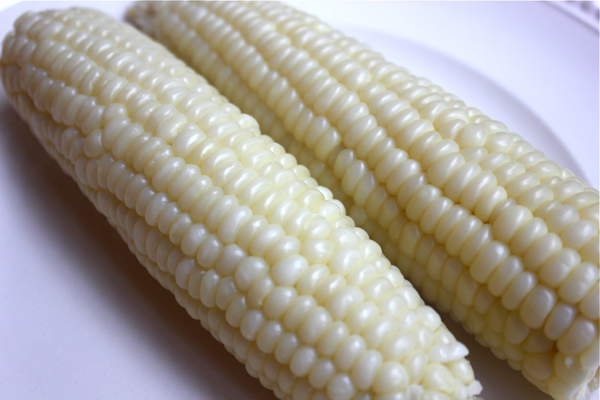 To make your corn in the microwave, put one ear of unshucked corn in the microwave and cook it for 3 minutes. Repeat with the rest of your corn. 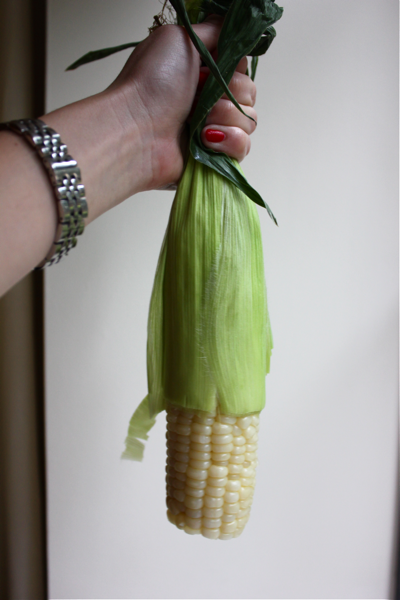 If you’d rather cook your corn another way, do so, but leave the corn unshucked. If I had a grill, I’d throw the ears right on there, maybe brushed with a little bit of oil to keep them from sticking. Once your corn is done cooking, use a serrated knife to cut the bottom of the corn off so that the kernels are at the base. If your corn is still hot, grab the top of the husk with a glove. The man in the video shakes his corn cob right out of its husk. My corn doesn’t come out that easily. I have to squeeze at it and push down on it, but when the corn pops out, it is perfectly cooked and completely hairless. Season to your liking and eat away! It is a great idea and eliminates the tearing off of individually wrapped corn sheathes. I have been using this method but microed for four minutes. Your corn pivs look so luscious I will do it three minutes like you do. I also do it for four minutes. I usually do two at a time for 8 minutes. Perfect every time! I hate husking corn!! This is so clean and easy! 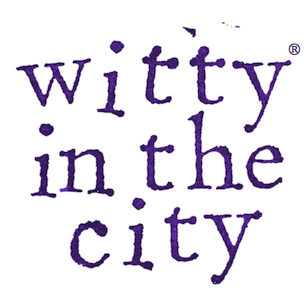 funny – i just discovered this method/video about 4-5 months ago and LOVE it! i feel ive been making TO MUCH corn now..! What an amazing idea! Will def try it! And I did try it tonight! It worked perfectly. I boiled 2 and grilled 2 ears. Worked on both. This is cool.